BALIF Gala: Celebrating 35 Years! 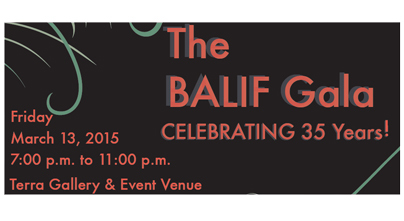 BALIF's 35th Annual Gala is on March 13, 2015. If you haven't done so yet, now is the time to sponsor BALIF and purchase your tickets to the Gala. This year's format is an elegant cocktail party with food stations and drinks sprinkled around the venue. It's a fabulous format for mingling with old friends and meeting new ones. Don't miss the best party of the year! Your sponsorship of BALIF and ticket purchases will fund law student scholarships, mentor programs, CLE, Amicus briefs on LGBT issues, LGBT recruiting, social events to LGBT lawyers, community outreach, and much more. If your business or firm would still like to sponsor the Gala, it is not too late to take advantage of some of the many benefits of sponsorship, such as recognition through the end of 2015 on the BALIF website and newsletter, and complimentary tickets to the gala. The Gala is BALIF's largest annual event with more than 600 attendees, including lawyers, judges, lawmakers, legal professionals, students, and in-house counsel. Please join us to celebrate the amazing progress our community has made over the past year. Want to get the party started early? BALIF members and Gala attendees will be meeting for a pre-party Gala location: Red Dog Restaurant and Bar, 303 2nd Street, San Francisco, CA 94107. Starting at 5:30 pm on the night of the Gala, please stop by for a pre-Gala cocktail, meet new friends, reconnect with old ones, and prepare yourself for the Gala! We invite your Firm to sponsor BALIF, the oldest and largest LGBT Bar Association in the country, for 2015. Why support BALIF? This past year, BALIF’s sponsors helped BALIF deliver a whole host of meaningful and exciting events for its members and the community as a whole. Because of its donors, BALIF was able to host a successful annual gala, co-sponsor a number of worthwhile events, provide for its mentorship program, and deliver many networking opportunities and social gatherings for the community. BALIF’s efforts would not be possible without the support of its sponsors. We hope that you will consider being a part of our wonderful group of sponsors. Your support of BALIF would help fund our law student scholarships and mentorship program, as well as provide for MCLE courses, amicus briefs on LGBT issues, LGBT recruiting, social events for LGBT lawyers, and much, much more. For your sponsorship, your Firm will receive the benefits listed below, including complimentary tickets to the BALIF Gala: Celebrating 35 Years! The Gala, BALIF’s largest annual event, boasts over 700 attendees, including lawyers, in-house counsel, judges, lawmakers, law students, and other legal and local luminaries. The 2015 Gala will be held on Friday, March 13, 2015, at the Terra Gallery & Event Venue (511 Harrison Street). BALIF’s Legal Service Award will be awarded to Tom Ammiano and Community Service Award recipients will be the GLBT Historical Society. Banner recognition as a Partner-level sponsor through the end of calendar year 2015 on BALIF website and in BALIF newsletter, and recognition at all BALIF sponsored functions, including firm logo displayed at Gala event, BALIF MCLE events, monthly networking receptions and law student functions. Admission for twenty people to 35th Annual Dinner and Awards Gala. Admission to VIP reception before the Gala with in-house counsel, judges, BALIF Board of Directors and National LGBT Bar Association Board members. Priority recognition as a Counsel-level sponsor through the end of calendar year 2015 on BALIF website, in BALIF newsletter, and at all BALIF sponsored functions, including firm logo displayed at Gala event, BALIF MCLE events, monthly networking receptions and law student functions. Admission for ten people to 35th Annual Dinner and Awards Gala. Priority recognition as Advocate-level sponsor through end of calendar year 2015 on BALIF website, in BALIF newsletter, and in all printed and online 2015 Gala materials. Priority recognition as Benefactor-level sponsor through end of calendar year 2015 on BALIF website, in BALIF newsletter, and in all printed and online 2015 Gala materials. Admission for five people to 35th Annual Dinner and Awards Gala. Priority recognition as Individual sponsor through end of calendar year 2015 on BALIF website, in BALIF newsletter, and in all printed and online 2015 Gala materials. Admission for two people to 35th Annual Dinner and Awards Gala. If you are interested in sponsoring BALIF at an even greater level than those listed above, please feel free to contact me directly at the email address or phone number below. Your Firm may also participate in a limited number of additional sponsorship opportunities at the 2015 Gala event, including naming and branding recognition at various food, drink, and entertainment stations throughout the event at the Terra Gallery & Event Venue, sponsoring the VIP Reception, and sponsoring the official Gala After-Party, likely in the Castro District of San Francisco. Prices for these additional sponsorship opportunities will range from $500 to $5,000+. Because these additional sponsorship opportunities are limited in number, please contact me as soon as possible if you are interested in any of these opportunities. For your sponsorship and advertisement to appear in the 2015 Gala program, you must respond, and your payment must be received, by Friday, January 30, 2015. If you should encounter any problems, please do not hesitate to contact me. We hope that you will become a BALIF sponsor this coming year and look forward to seeing you at the 2015 Gala as we celebrate 35 years of fun and festivities!